It's hard to pronounce judgement on something that intrisically draws you in, yet you find that it repeats motifs known from a previous incarnation losing points for originality in the process. Elie Saab Le Parfum, though no match for the glorious haute-couture gowns that are the stuff of dreams, is nevertheless a very alluring, beautiful floral with honeyed notes, standing proudly in the mainstream market, intending not to leave anyone displeased. The fact that acclaimed perfumer Francis Kurkdjian pulls another well-known trick from his elegant sleeve is of secondary importance for our purposes, questioning structure and innovation vs appeal and end result as we are; consumers go for the latter, critics for the former. Francis Kurkdjian places a small facet of his beloved zafting, retro roses (Rose Barbare, Lady Vengeance, Enlevement au Serail, Ferre Rose) in a composition that is all about the white flowers: jasmine and in a more abstract, fleeting way orange blossom (similar to that reserved for Fleur du Mâle, Narciso for Her ). Smelling Elie Saab Le Parfum in the middle of winter is like a ray of longed for sunshine, summer evening romance and late afternoon trysts spent on white linen sheets on the hush in rooms bursting with flower bouquets. It's elegant, lush, quite sweet after the initial orange blossom/neroli "cologne" top note dissipates (and sweeter on skin than on clothes or blotter) with a posh impression that radiates for miles with the discernible headiness of jasmine; a not really indolic jasmine, nor particularly candied, but lush, creamy and sensual all the same. Elie Saab is a fragrance to be noticed and to be noticed in, smelling expensive, especially for a mainstream release, which also lasts quite well. The woodiness is mingled as an austere, cleaned up layer that lingers on skin similarly to woody floral musks fragrances (Narciso and its ilk; the clean patchouli, non powdery rose & honeyed warmth accord is repeated down pat). Kurkdjian takes segments out of his collective opus and re-arranges it like a talented maestro playing a biz potpouri of his greatest hits. Can't blame him; it works. The first fragrance from the Lebanese haute couture designer is simply called Le Parfum and the composition allegedly took 279 trial versions, resulting in a very femme fragrance, very floral, lightly woody. Those who like Marc Jacobs Blush in theory for the modern take on white flowers, but always wanted more oomph out of it, might find here their ideal rendition. Those who love the lushness yet contemporary feel of Kurkdjian's own label Absolue pour le Soir but wince at the price tag, could find in Elie Saab a more budget-friendly choice. Last but not least, those who lamented the demise of perhaps the single worthwhile Armani perfume, Sensi, are advised to seek out Le Parfum as something in the same ballpark; immediately appealing, non fussy, instant prettifier. Men are almost certain to find this too feminine for their tastes, though the adventurous can always try. Notes for Elie Saab Le Parfum: orange blossom, jasmine (including Grandiflorum and Sambac), cedar, patchouli and rose honey accord. The simple glass bottle, heavy and pleasingly solid, was designed by Syvie de France. The campaign features the famous model Anja Rubik. Le Parfum is available in 30ml/1oz, 50ml/1.7oz and 90ml/3oz of Eau de Parfum concentration with ancilary products to match (perfumed deodorant, body lotion, body cream and shower gel). Available at major department stores. 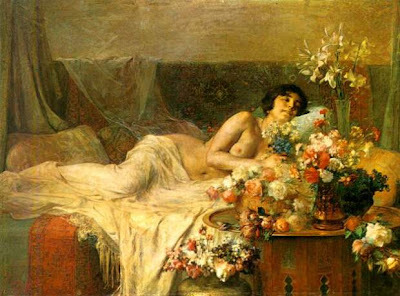 Painting Spring by Greek painter Georgios Jacobidis. I sprayed it in store and found it way too sweet fruity, like a cloud of sugar. But after reading your review, I'm thinking I should resmell to make sure I wasn't tired. I think it warrants a second trial, though it's too feminine for unisex use. The fruity note comes from the jasmine sambac itself, I believe.